Abang Johari (eighth left) leads the cake-cutting ceremony accompanied by (from seventh left) his wife Datin Patinggi Datuk Juma’ani Tuanku Bujang, Abang Helmi, Awang Tengah, Naroden, Talib, Len Talif (front second right), and Husni (right). KUCHING: Sarawak Bumiputera Entrepreneurs Chamber (DUBS) members have been asked to embrace doing business online to become part of the global digital economy. Chief Minister Datuk Patinggi Abang Johari Tun Openg cited Alibaba, Amazon, and eBay as among the successful online businesses that are able to trade at all times. 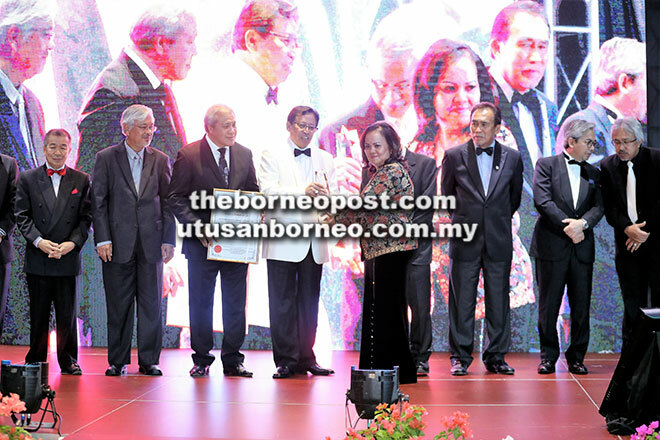 “The ecosystem in the current business climate these days has changed and Bumiputera entrepreneurs must change the way they do their business today so that they can be more competitive locally and globally,” he said during the Sarawak Bumiputera Entrepreneur Awards on Wednesday. Abang Johari said he and the state government are committed to enabling the business community to go digital. “If we want our DUBS members to be successful like these online business magnates, then we must help them through providing ICT (information and communication technology) infrastructure,” he said. Abang Johari also advised DUBS members to utilise the state-owned Development Bank of Sarawak (DBOS). “The government has also approved a fund of RM30 million a while ago and has started a digital village in Kuching. And the government is doing the same for Betong, Miri, Limbang, and Lawas so that the business community in these areas can use good and faster internet and be part of digital economy,” he said. 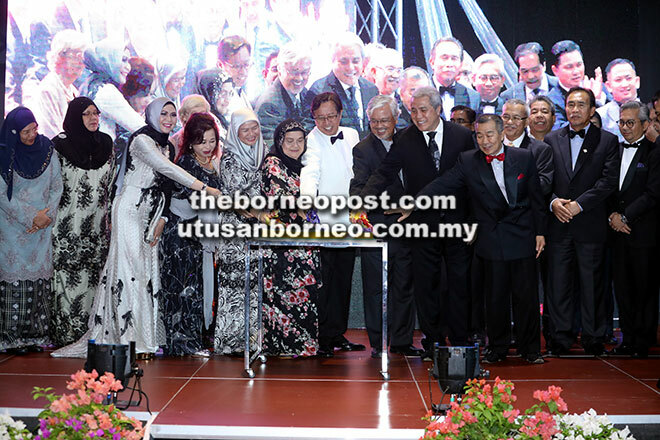 Abang Johari also urged DUBS members to be involved in agro-park projects under the Ministry of Agriculture and Agro-Based Industry by developing idle land. “We encourage DUBS members to participate and for that matter the government can always assist and even have an equity in any project by these members to ensure that it becomes a successful entity,” he said. Abang Johari also witnessed the symbolic handing over of RM112.9 million approved under the Bumiputera Agenda Steering Unit’s (Teraju) Facilitation Fund for various projects to DUBS for Sarawak Bumiputera companies. The Bumiputera Entrepreneur Excellence Award 2017 went to Rheineld @ Minor Panyau of Untang Jaya Sdn Bhd. For the Successful Bumiputera Entrepreneur Award, the winners were Safri Mohammed of PU Architects Sdn Bhd (professional services), Daud Mohamed of Maysville Sdn Bhd (oil and gas services), Masnah Sahari of Thiba Dhuba Enterprise – Mira Cake House (manufacturing), Aisyah Othman of An-Nashr Resources (construction), and Nur Rahmah Ranong Abdullah @ Ranong Peru of Nadinmas Enterprise – Ran & Nong Creations (e-commerce). The Most Promising Bumiputera Entrepreneur Award went to Ali Azis Salleh of Techno Analysis Sdn Bhd (men), and Shirley Hasmani Eddie of Rafflesia Spa Sdn Bhd (women). Present at the ceremony were Deputy Chief Minister Datuk Amar Awang Tengah Ali Hasan; Minister in the Chief Minister’s Office (Integrity and Ombudsman) Datuk Talib Zulpilip; Assistant Minister of E-Commerce Datuk Mohd Naroden Majais; Assistant Minister of Urban Planning, Land Administration and Environment Datu Len Talif Salleh; Teraju executive officer Datuk Husni Salleh; and DUBS president Datu Abang Helmi Ikhwan.